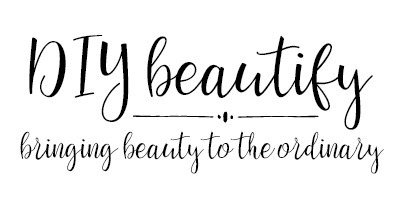 Have you seen all the wood slices appearing in stores, around blog-land and on Pinterest lately? I love them because they add texture and a natural element in decor. 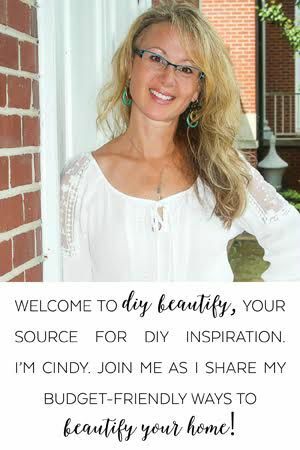 I have some ideas to share today that will show you how to use wood slices in home decor. If you read my post about Wood Slice Pumpkins, you'll know how I came by my wood slices. And no, I didn't buy them at a craft store....they're real, DIY wood slices...as in sawing a log (not to be confused with sawing logs...although I do love my sleep!). I've decorated a lot of wood slices, and learned a few tips along the way that I'm happy to share with you so you have the best experience crafting with your wood slices! 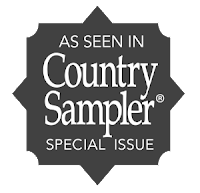 I've included affiliate links for your convenience (you can find my full disclosure policy here). My first wood slice project was something I did for the new coffeehouse at our church. 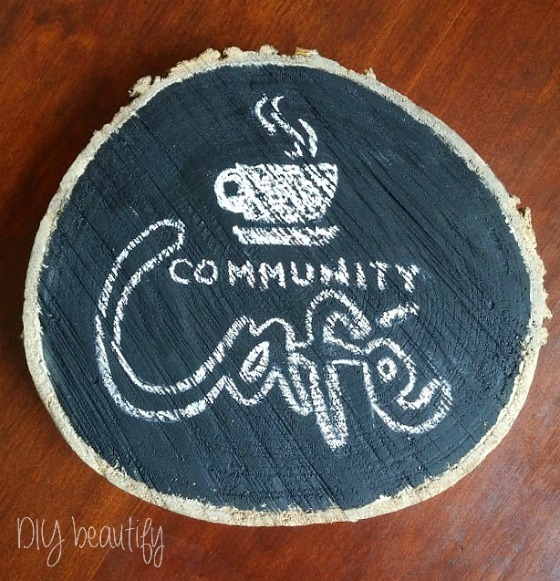 I painted wood slices with black chalk paint and transferred our Cafe logo to the slice with chalk. They're being used as centerpieces on the tables in the Cafe. Using chalk to write and draw is a little more difficult on wood slices you've cut yourself because the surface is not perfectly smooth. However, as you can see, it can be done. Before painting and writing on the wood slices, I used my little Ryobi Corner Cat to sand the surface as smooth as I could get it. This little sander might be small, but it's powerful! Sanding the wood slices made it much easier to 'draw' on them! 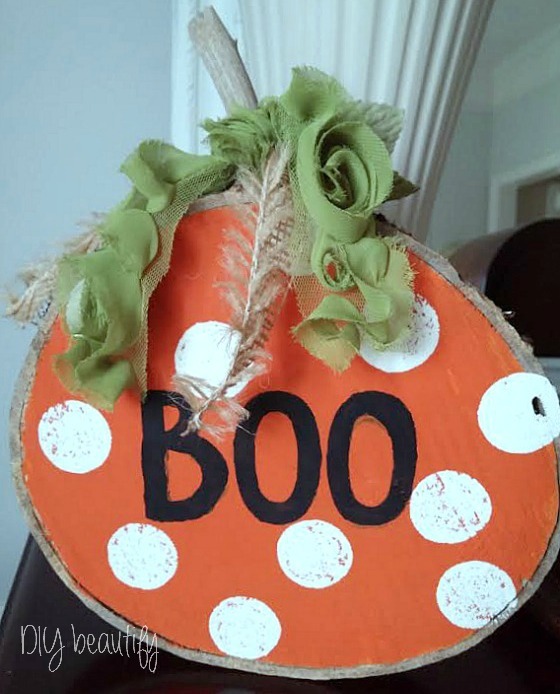 These next examples are decorated wood slices that look best standing on their edge....cute little seasonal decor items. Depending on your wood slice, they can stand on their own or get a little help with a table top easel. Tip #2: Find the right angle! Play around with the angle and placement of your wood slice before you decorate it (I might have learned this lesson from experience!). You want to find the most level side so it can stand up by itself, if at all possible! 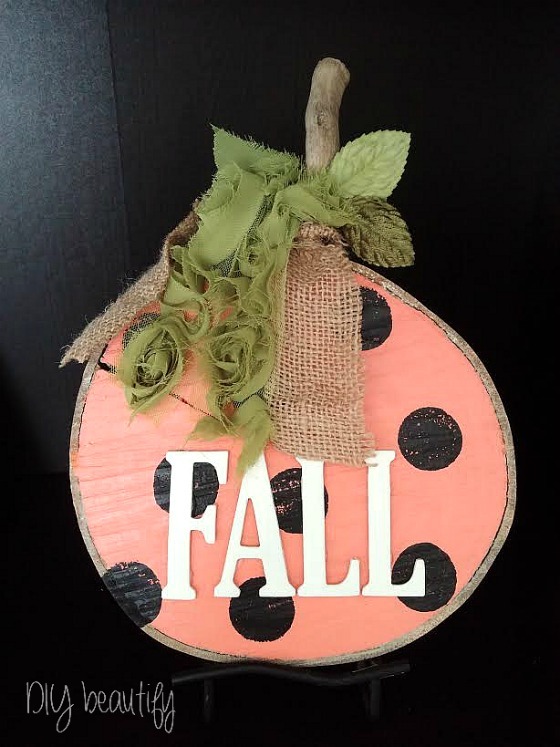 My wood slice pumpkins each have a driftwood or stick stem that has been glued to the top. I've used various ribbon, trim and burlap to add some interest around the stems. 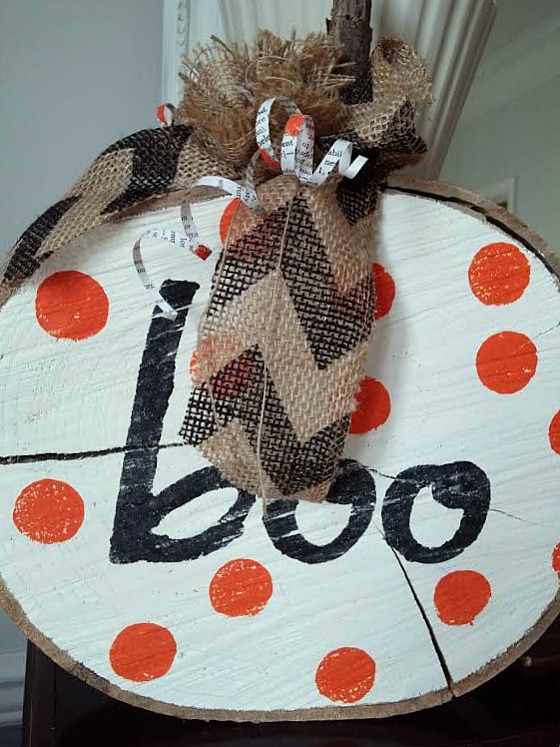 The above 'boo' pumpkin has curlicues made from very narrow strips of dictionary paper. I simple wound them around a pencil, and they held their shape. Unfortunately, what can happen when you cut your own wood slices is that as the slices continue to dry, they will develop cracks/splits. I had no idea this would happen and was very bummed. I did some research and found there is a wood preservative you can buy that you soak your wood slices in. The product stabilizes the wood to prevent splitting. It's not that expensive, and I wish I would have known about it before painting and decorating all my slices. Oh well, splits add character, right?! 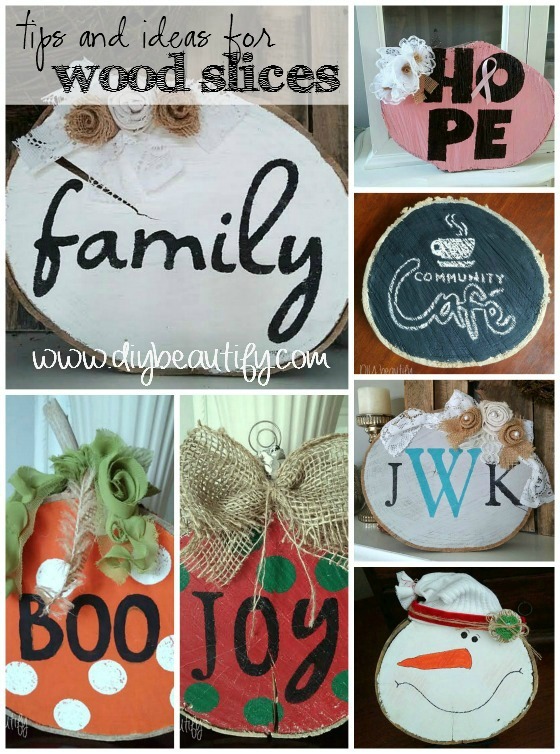 You don't have to go with a woodsy, hunter/deer/cabin theme just because you're decorating on wood. Wood slices can be pretty and feminine too! These next two wood slice ideas were made with larger slices. They're sturdy decorative elements that add rustic charm to any room. This 'family' slice makes a striking appearance on my mantle. I painted it creamy white, added painted letters using a stencil I created on my Silhouette machine and handmade roses from burlap and drop cloth. I love the feminine-meets-rustic combination! I made the one below for my girlfriend's birthday. It's created with her colors and style in mind. I added lace, burlap and drop cloth flowers to this one too, in addition to small pearls and crystals. 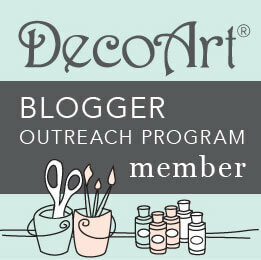 Tip #5: A wood slice can become anything you want it to be! Don't be limited by what you see here or on Pinterest. 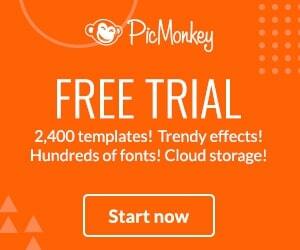 Use your imagination and make it Your Own! 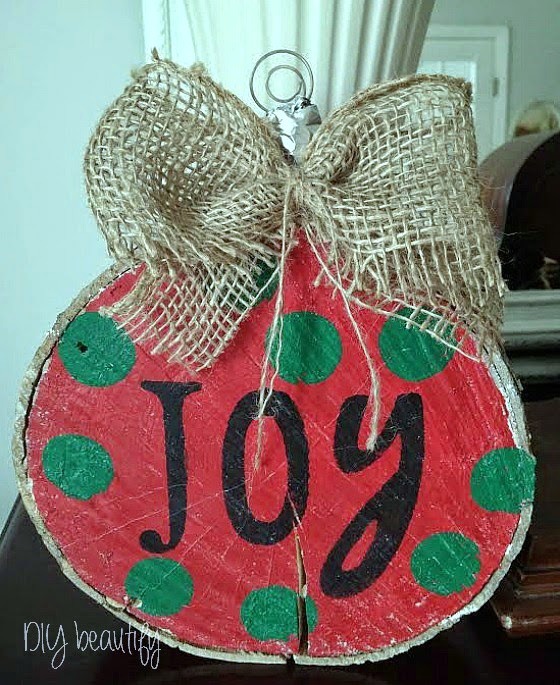 Wood slices can make adorable jumbo Christmas ornaments! The ornament hanger was created using a short stick wrapped in tin foil and then adding a large circle paper clip to the top after I attached it to the wood slice. A wood slice can become a quirky little snowman. 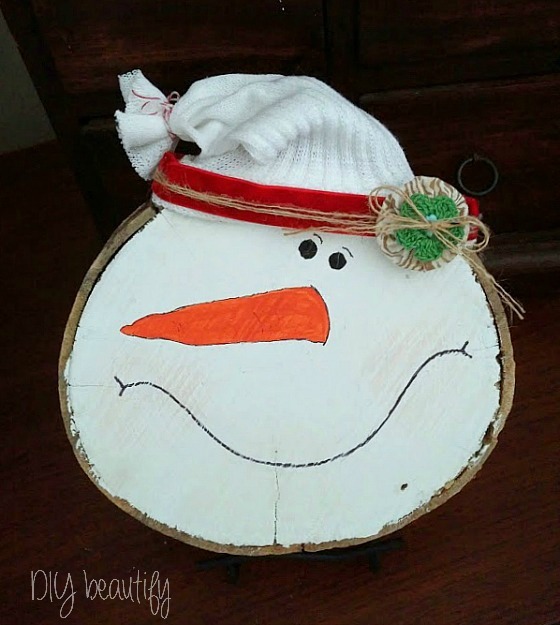 A round wood slice is the perfect shape for a little snowman face! After painting the slice white, I painted a sweet snowman face, then cut toe off a white tube sock and hot glued it on the slice for a cute hat, of course adding lots of embellishments for more texture and appeal. A wood slice can be a source of inspiration! 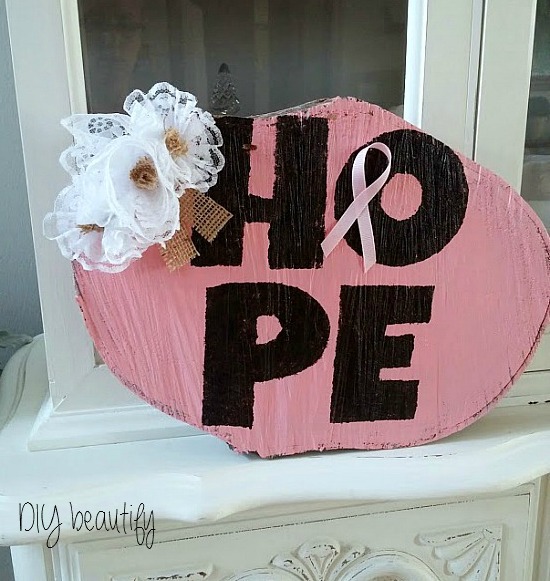 I created my pink Breast Cancer Awareness wood slice in honor of my mother-in-law Joan, who's been cancer-free for 30 years! 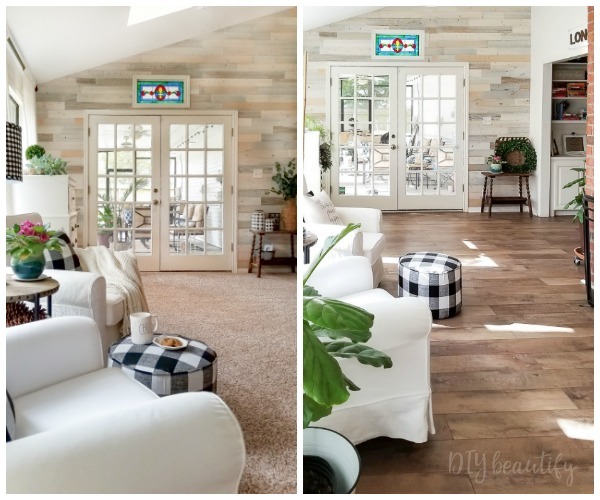 If you've been wondering what to do with a wood slice, I hope these ideas have inspired you! 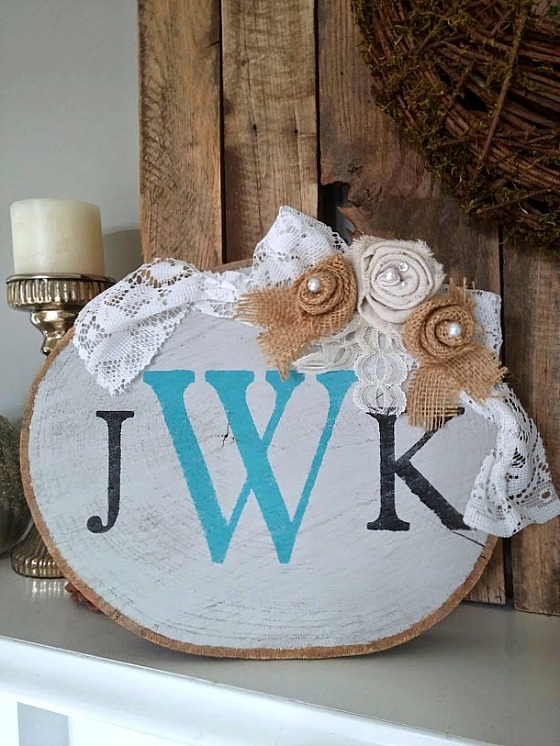 With a little paint and imagination, you can create a custom wood slice that will work with your home decor and your family! 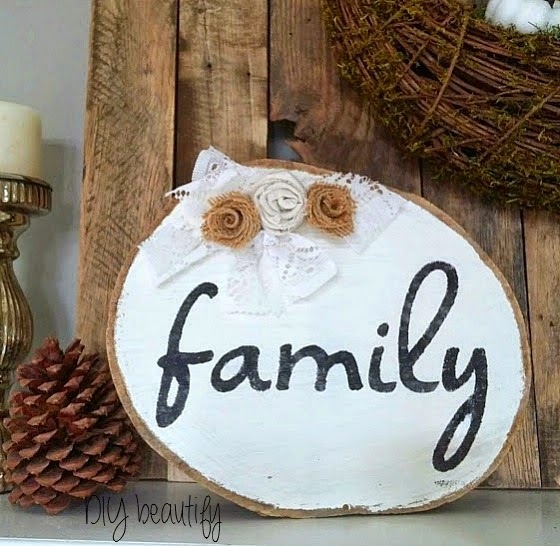 You can find pre-cut and sanded wood slices at Michaels, Hobby Lobby and other craft stores!